I am offended and embarrassed by the editorial cartoon featured on April 18 concerning the shootings at Virginia Tech. In the aftermath of the shootings that occurred at Virginia Tech earlier this week, the University of California is now re-evaluating its own security policies. 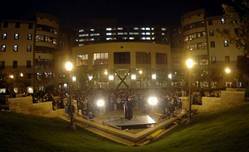 Students and university employees joined together last night in De Neve Plaza in remembrance of victims at Virginia Tech. 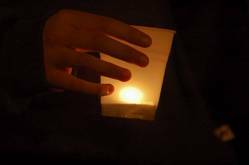 Approximately 500 candles were handed out to attendees. 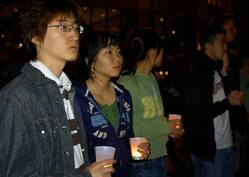 First-year psychobiology student John Seo (Left) and first-year undeclared student Jenny Lee (next) listen to student speakers sharing their thoughts during the vigil. Reider Larsen, a first-year undeclared student, signs a quilt Thursday night that will be sent to Virginia Tech. 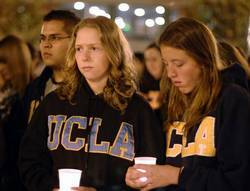 An alumna of Virginia Tech attended the vigil to thank UCLA. Students comfort each other during yesterday&#39;s candlelight vigil held in memory of the victims of the Virginia Tech shooting. Samara Leader, a second-year political science student and Sarah Peters, a first-year mathematics and economics student share in a moment of silence. 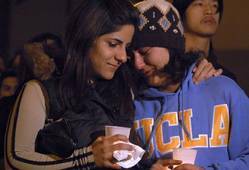 Tears rolled down many UCLA community members&#39; faces in De Neve Plaza on Thursday night, as hundreds gathered to honor the memory of the victims of the recent tragedy at Virginia Tech. It&#39;s no secret that the news media exercises bad judgment at times.